This is lesson 9 of 42. This series is currently in-progress and will have new lessons each week, visit Bethany’s author page to see the latest available. Play a quick review game by randomly calling out one of the definitions and asking kids to name which truth about God that refers to. Start out by reading this week’s memory verse (Psalm 72:19) and then asking if anyone in the group can define the word glorious. Point out that the word glorious has the word glory in it and ask if anyone knows what the word glory means. 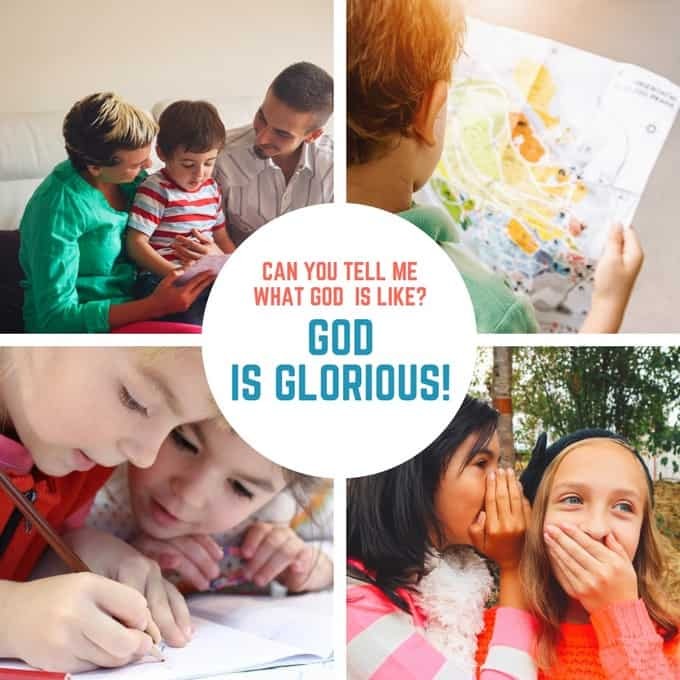 Let the kids know that you’ll explain more about the words glory and glorious in a minute. This story is while the people of Israel are out in the wilderness between Egypt and the promised land. Moses went up on the mountain to meet with God and while he was on the mountain the people freaked out and made a statue of a golden calf and were worshipping it. Moses came down from the mountain, saw what they were doing and he destroyed their idol and broke the stones with the 10 commandments that God had just given him. Then, Moses went back up to the Lord to see if he could make up for their sin. Moses asked God to forgive their sin and even offered to take the punishment for their sin upon Himself, but God said that their sin would have to be punished and sent a plague on the people of Israel. Then, God told Moses that He could no longer lead them to the promised land because of their rebellion and said that if He stayed with them that He might destroy them on the way. When Moses told the people what God said, they were sad and the repented of worshipping the golden calf. After God passed by him, Moses worshipped God on the mountain. While Moses was on the mountain God gave him the 10 commandments again, as well as more laws and rules. When Moses came down from the mountain his face was shining because he had been in the presence of God and had seen the glory of God. Moses had to cover his face in the camp, but every time he went back into the tent of meeting to meet with God, he uncovered his face and spoke with the Lord. EXPLAIN: Remind the kids in the group that in today’s story Moses asked to see God’s glory…. he wanted to see the greatness of God. God passed by him and met with him and just from spending time with God, Moses‘ face was changed….because he had been in the presence of the glory of God. Since motions & actions help kids remember, choose an action for GLORIOUS. A good motion might be to hold your hands up by your face like a mirror to remember God’s glory reflecting on Moses. Or, you may want to wave hands in the air in praise. Read the memory verse (Psalm 72:19) a few times together and do the motion for glorious. “Do you know what the greatest display of God’s glory is? It is when Jesus died on the cross for our sin and rose from the dead! By dying on the cross, Jesus displayed God’s mercy and grace for all to see. That gave God great glory! Moses tried to take the punishment Israel deserved, but he couldn’t because he was a sinner. But Jesus did what Moses could never do. He lived a sinless life and then gave it up for us. Now that is glorious!” (The Gospel Story Bible- page 74). In our story this morning, God showed His glory/ greatness to Moses and Moses was never the same. When we understand the glory of God and how God gave His only Son to rescue us from our sin, we will never be the same either. We can’t be in the presence of God and know what He has done to rescue us without our lives changing forever. Give each child a blank piece of paper provide markers or colored pencils. Encourage them to write the word glorious somewhere on the paper and then write or draw something to help them remember this attribute of God. You may want to provide a mirror and encourage some of the kids to attempt to write in reflection by holding the paper up facing the mirror and looking at the paper in the mirror while writing on the paper. Or, you could encourage them to draw Moses with a veil on his face after seeing God’s glory. After a few minutes, bring the group back together and give kids time to share what they have drawn or written. Pray that the kids in the group would start to see and experience more and more of who God is through this study and would turn to Him for salvation.